Printed by Benjamin Vaughan for distribution in America in the year 1800. The Rural Socrates Speaker Series features talks by authors or academics whose works speak to the literary, cultural, scientific and philosophical passions of Benjamin and Sarah Vaughan. Their personal library of almost 12,000 volumes was, at the turn of the 19th century, second in size in New England only to that of Harvard University. Family lore holds that the walls in the Homestead were covered in books two and three-deep! Benjamin and Sarah were generous with their collection, and Sarah maintained a lending library, traveling around Hallowell delivering and picking up books. She was most passionate about children’s education, and a collection of her educational books is preserved at the American Philosophical Society (APS) in Philadelphia (read more about Sarah’s books in this APS online exhibit). Benjamin’s interests were vast, including, but not limited to medicine, science, politics, and agriculture. Benjamin’s papers, including many books, are preserved at Bowdoin College, Massachusetts Historical Society, the American Philosophical Society, and Vaughan Homestead. “Modern agriculture became a consuming interest for Benjamin Vaughan,” writes biographer Craig Murray, “Believing that excellence in agriculture was the key to national prosperity, Vaughan sought ways to aid its cause.” In 1800 Benjamin printed an American edition of The Rural Socrates: An Account of a Celebrated Philosophical Farmer Lately Living In Switzerland and Known by the Name of Kliyogg for distribution throughout the young nation. According to Murray, “Benjamin greatly admired Kliyogg’s native intelligence, honesty, diligence, and philanthropic helpfullness and hoped these qualities would somehow commend themselves to multitudes of American farmers and immigrants.” It is in honor of this book and Benjamin’s deep belief in its message, that we name our speaker series. 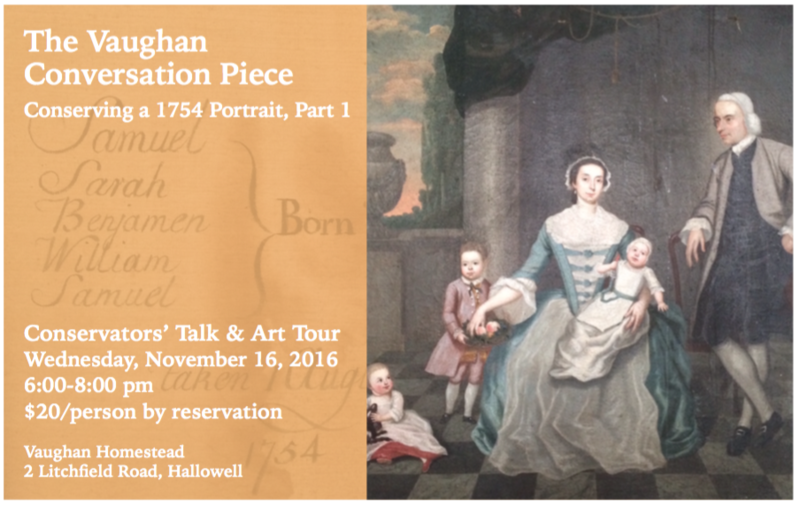 Matthew Hargraves, Chief Curator of Art Collections at the Yale Center for British Art joined conservators Nina Roth-Well and Johanna Moore to welcome back the newly conserved 1754 Vaughan Family Portrait. Nina Roth-Wells and Johanna Moore, professional painting and frame conservators spoke at the Homestead in November of 2016 about their work to the 1754 Vaughan Conversation Piece family portrait. Thomas Hubka, author of “Big House, Little House, Back House, Barn: The Connected Farm Buildings of New England,” spoke at Hallowell City Hall on July 11, 2015. 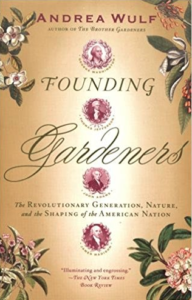 Andrea Wolf, author of “Founding Gardeners: The Revolutionary Generation, Nature, and the Shaping of the American Nation,” spoke at Hallowell City Hall on September 15, 2014. Christian Becksvoort, author of “With the Grain: A Craftsman’s Guide to Understanding Wood,” spoke at Vaughan Homestead on September 14, 2013. 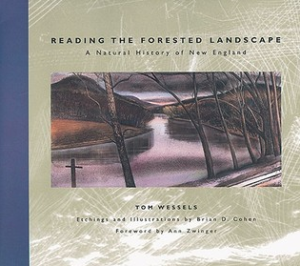 Tom Wessels, author of “Reading the Forested Landscape,” spoke at Vaughan Homestead on October 19, 2013 and led a hike through Vaughan Woods. William Fowler, acclaimed author and distinguished Professor of History at Northeastern University spoke at Hallowell City Hall about “Maine’s Post-Revolutionary Move Toward Independence And The Role Hallowell Played” on October 20, 2012. Linda Brockway, award-winning landscape designer and preservationist spoke on “New England Gardens: Lost, Found and Rediscovered” at Vaughan Homestead on Saturday, August 18, 2012. Robert Thorson, author of “Stone By Stone,” spoke at the Ladd Center in Wayne on March 23, 2006. The talk was co-sponsored by Vaughan Homestead and the Kennebec Land Trust.